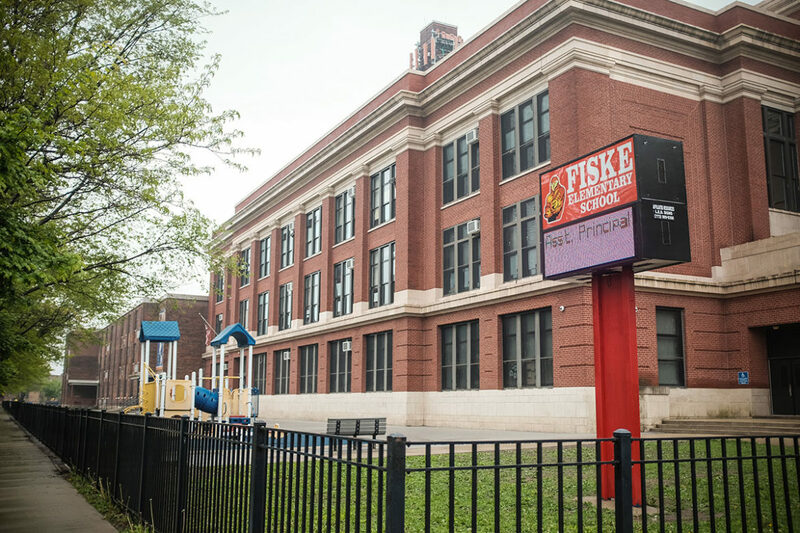 Fiske Elementary in Woodlawn is one of 14 “welcoming” schools that the district forced to change buildings when they took in students displaced by the 2013 mass closings. This led students who already attended these schools to transfer out at higher rates. Lamont Morton Jr. was in fourth grade when Chicago school officials closed his West Side elementary school in 2013. Lamont transferred to a “welcoming school” a few blocks away, where officials said he and other students from his closed school would receive the supports they needed to make the transition. Before the closure, Lamont’s teachers had recommended his parents seek out a selective school where Lamont would face greater academic challenges. But after changing schools, Lamont fell behind in math and he had to stay after school to catch up. “Some of the stuff I needed to do was complicated and they needed to help me get where I needed to be,” Lamont told me in February 2017, as I interviewed him and his dad, Lamont Morton Sr., in their Austin home. Morton said he noticed Lamont and his younger brother both were struggling, and he suspected the stressful transfer to a new school had something to do with it. Like Lamont, thousands of students experienced negative academic outcomes after the 2013 school closures, despite the fact officials promised them a better education, according to a sweeping report released Tuesday by a team of researchers at the University of Chicago Consortium on School Research. See our series on the aftermath of 2013’s mass school closings. The study is the most comprehensive yet to evaluate the educational, social and emotional impacts of the city’s decision to close an unprecedented 50 schools five years ago. Using a combination of data, surveys and interviews with students and school staff, researchers compared the experiences of impacted students, most of whom were black and low-income, with students in similarly under-enrolled and low-performing schools that were not closed or designated to take in kids. While officials said the main reason they closed schools in 2013 was to save money, the district has never reported if it did. One of the most troubling findings is that students from closed schools saw long-term negative effects in math. Students tested two months behind their peers in math the year the closures were announced. That gap persisted for four years. Researchers think this could be due to how children learn math: if they miss a key concept early on, it’s more difficult to progress. Students in the closing schools were also about one and a half months behind their peers in reading the year the closures were announced. Those reading scores rose back up to expected levels two years later. Students in the welcoming schools tested about one and half months behind their peers in reading the first year after the closures — though their scores also rebounded the next year. Researchers say they hope these findings will be taken into consideration as Chicago and other school districts across the country weigh the pros and cons of closing schools. Chicago officials imposed a five-year ban on shutting down schools after 2013. That ends this year. Already, district officials plan to close four under-enrolled, majority-black high schools in Englewood on the city’s South Side and to turn a majority-black South Loop elementary school into a high school, despite the fact it doesn’t meet the low academic or enrollment criteria officials have used to close schools in the past. “There are a lot of important lessons learned in terms of how to make improvements in the future,” said Senior Research Analyst Molly F. Gordon, who co-authored the study. Some effects took years to detect. While researchers found that students from the closed schools’ GPA in the core subjects of English, math, science and social studies rose at first, by the third and fourth years after the closures, they were lower than expected compared to their peers. This impact was most noticeable among the estimated 4,000 students who were in 3rd to 5th grades when their schools closed. This indicator is a key predictor of whether students will stay on track and graduate from high school — more so than test scores. Researchers say it’s possible that because students from closed schools were often labeled as “low performers” by school staff, it shook their confidence and, in turn, they did worse. Lamont Morton Jr. attended Emmet Elementary in Austin before district officials closed it in 2013. Like many students, he fell behind in math when he transferred to his nearby “welcoming” school. 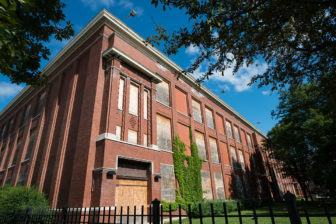 Eve Ewing, a sociologist at the University of Chicago who is writing a book about the impacts of the 2013 school closures that will be released in October, says these academic effects are a cause for concern. The report’s authors also spent time interviewing students and staff at six welcoming schools, looking for commonalities among their experiences. The findings validate much of what parents, students, educators and school communities have said for years: the mergers were rushed and poorly planned, which made it hard for schools to properly support their students. While schools appreciated the iPads and extra money CPS gave them during the first year, staff said they received little training on how to use the new technology and when the one-time infusion of cash ran out after a year or so, supports like extra social workers disappeared. The way the closures played out also hurt the surveyed schools’ internal cultures, researchers found. Before the mergers, schools in the same neighborhoods felt like they were “pitted against” one another in an emotional, months-long battle to keep their schools open. This, coupled with the chaotic transition, “resulted in feelings of anger and resentment across communities,” the report states. Staff and students in welcoming schools also reported an increase in student fights and bullying, especially the first year after the closures. While that improved with time, the staff’s perceptions of conflict remained higher than before the mergers, and students reported that early stereotypes about them persisted. In one case, students heard welcoming school staff talking about how kids who came in from the closed school had lower test scores. “Like on my first day back here, even the teachers would even say, ‘Oh, you’re a [closed school] kid, so you’re lower than the rest of the kids, ‘cause [the welcoming school was] such a high [scoring] school,’” one student told the researchers. Educators said they needed the district to provide more support and training on merging schools, more emotional support for staff and additional funding and emotional supports for students beyond the first year after a closure. Chicago Public Schools’ CEO, Janice Jackson, admits that the way the district handled the 2013 closures — under different leadership — was “imperfect.” She says the district learned from those shutdowns; she doesn’t intend to carry out any more widespread closures. When asked if the students the report showed had been harmed by the 2013 school closures were owed anything, Jackson said: “I think what we owe the students is what we’re doing,” pointing to a rise in the number of top-rated schools in the district since the closures five years ago. “While we know that there was some impact based on those who participated in the closings and those that didn’t, I think it’s important to note that these students are still progressing,” she said. Children in Chicago, especially Black, Latinx, and poor children, deserve better. For the most part, leadership is dysfunctional and incompetent from top to bottom in Chicago. The sad story is that so many people benefit off the industries that are generated by poverty, school failure, and career politics. As a Black resident of Chicago, I would suggest that all Black families boycott the first 30 days of the school year. Make that suggestion and see what happens. Everyone will crawl out of the woodwork claiming that it is necessary to send their Black into a system (traditional AND charter) that is clearly not educating them. They will also ask “How are you going to educate them?” which is a message to Black parents and adults that those who are vested in the system do not believe that you can educate your children. Bought Black politicians, community “leaders,” preachers, and so many others will line up behind the Mayor to proclaim this a bad idea, showing their sheer ignorance of history. However, it is only a bad idea because everything they gain off the backs of Black children will be threatened. CEO Jackson should be ashamed of shepherding a system where disruption, displacement, and incremental change at best are deemed good enough for Black children. Boycott first 30 days and listen to all the rationalizations and false promises that will be given. Boycott!! As people continue to leave the area in droves, the number of schools needed will continue to decrease. No amount of complaining of boycotting will change that.